It's all in the bread. It's here. Tomato season. The plants have been growing since March, but the fruit just arrived in July. And now that August is finally here, those green globes are turning shades of red, orange and yellow and slowly sweetening. When the fruit turns ripe, the tomato problem quickly shifts from being without to stocking an overwhelming abundance. It's a great problem to have. With tomato salads, tomato sauces and tomato salsas to be had, there's a good many things to make with the bounty of summer tomatoes. But all those recipes pale in comparison to the tomato sandwich (of which you should be eating at least one a day during the month of August). This is not a sandwich with tomato in it, but a sandwich made of nothing more than summer's sweetest fruit. 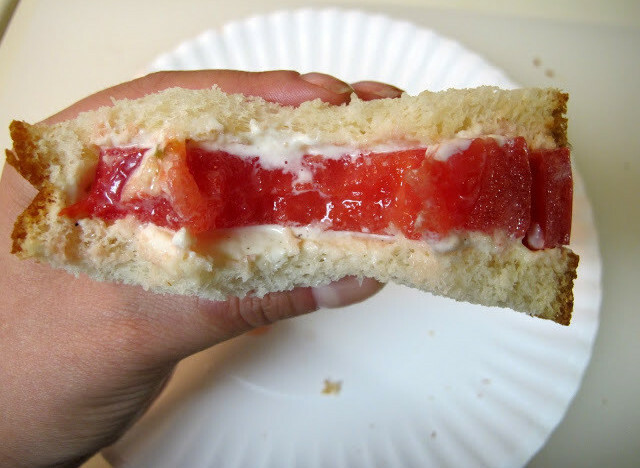 Thick, summer-ripe tomato slices and white sandwich bread (with mayo, of course). That's it. Blackberry Farm's master gardener John Coykendall, a genius on the topic of heirloom tomatoes, shared the secret to building the best tomato sandwich: "To me there's one requirement. Of course you have to have tons of mayonnaise and salt and pepper, but the true requirement is you have to have that old, cheap, white bread. The kind you wouldn't ordinarily touch in your daily life. It's the one thing that it was created for, tomato sandwiches. You stand over the sink [eating it] and it runs like Niagara falls -- it's wonderful." We don't know about you, but we are so on board. Pass the Wonder bread, please. Need more instruction? Let Southern Food Blogger, i believe i can fry, walk you through the steps.